Blend the welcoming culture of wine country with the area's arts and gourmet food and you get St. Helena. This vibrant community is inviting with sprawling vineyards, and beautiful, photo-worthy destinations shouldn't be missed. If you're planning a trip to Napa Valley, be sure to add St. Helena to your trip. St. Helena's central location makes it a great base for exploring all of Napa Valley, not to mention its 19th-century charm. 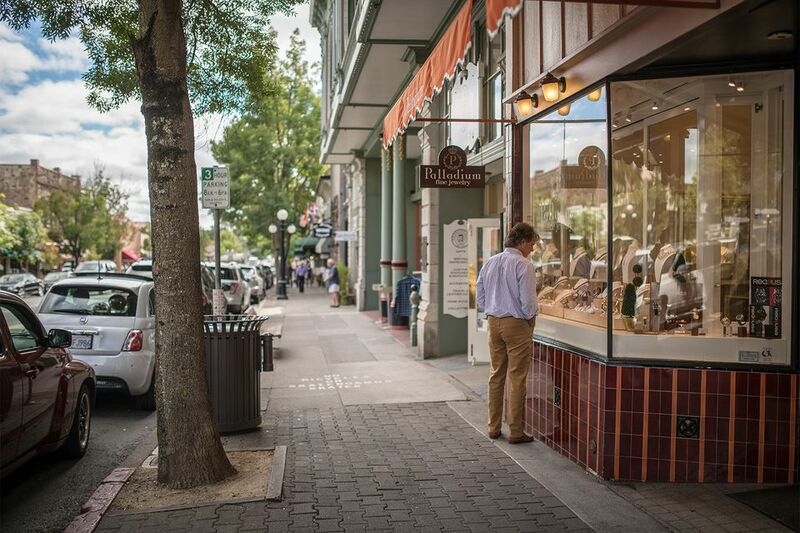 Food-lovers will especially like food shopping, wine-tasting, and dining in St. Helena. If you enjoy the relaxing atmosphere of Napa Valley, then you'll feel at home in St. Helena. Wine Tasting, Winery Tours: Popular wineries near St. Helena include Beringer, Spring Mountain, and Schramsberg (sparkling wine). Port wine lovers may also want to visit quirky Prager Port Works with its "original website" and some fine port wines. Shop on Main Street: A stroll down this tree-lined street lined with 19th-century buildings will take you past a nice selection of art galleries, clothing shops, and food shops, several of them offering local olive oils for tasting. If you want something sweet, stop by Woodhouse Chocolate, a beautiful boutique that displays their exquisite chocolate candies like jewels at Tiffany's. Silverado Museum: It's not for everyone, but if you're a fan of Robert Louis Stevenson, this museum next to the city library has the largest collection of Stevensonia outside of his native Scotland. Learn About Cooking: Take in a cooking demonstration or class at the Culinary Institute of America, and you'll get to sample the results. Foodie Fun: Dean and DeLucca on the south end of town carries a full line of gourmet and specialty foods, premium wines, and high-end kitchenware, but St. Helena has some local spots that can also make a foodie swoon. Sunshine Market (1115 Main St.) may look like an ordinary grocery store, but inside you'll find an extraordinary selection of cheeses, wines, and other gourmet products. Further down Main Street, Steves Hardware (1370 Main Street) carries a full line of nuts and bolts, but they've also got an outstanding kitchen department, with everything from tiny tart pans to mammoth pasta pots. The Hometown Harvest Festival & Pet Parade, held in October in St. Helena downtown, is when the locals celebrate the end of harvest season. As the fall leaves begin to fall, locals and visitors alike take to the streets to get a taste of the area's wine, take part in local arts and crafts, and just hang out. St. Helena is 66 miles north of San Francisco and 19 miles north of the town of Napa, in the middle of Napa Valley. Take U. S. Hwy 101 north across the Golden Gate Bridge. Exit at CA Hwy 37 East (exit 460A), then follow Hwy 121 north and east, and finally, go north on CA Hwy 29. Race days at The Raceway at Sears Point can cause slow going through the Hwy 37/121 intersection. An alternative (which is also a good route anytime if you're traveling from the east side of San Francisco) is to take I-80 north, exiting at American Canyon Rd. west, which connects to CA Hwy 29 north.